The last mile is an expensive mile. Figure out a way to reduce it, and you improve the bottom line. Or at least that’s the case for carriers, said Patrick Browne, director of global sustainability at UPS. With an average 60,000 UPS van drivers on the U.S. road each day, making 120 deliveries each, according to Browne, small tweaks can make a big difference in fuel efficiency and miles driven. In the era of e-commerce, sustainability in last-mile delivery is even more of a hot topic thanks to the Amazon effect. The increase in online shopping and the promise of fast delivery means more one-package-per-stop trips to consumers. Traditionally for B2B deliveries, multiple packages are delivered per stop, making deliveries more economical and decreasing the per package carbon delivery footprint. While carriers try to decrease the miles driven and time on the road, retailers look at the deliveries from a different vantage point. Their goal is to increase profits while pleasing customers with on-time delivery. Add in consumers, who often claim they care about the environment yet continue to place online orders without considering the environmental impact of their actions. Partly to combat the inefficiencies of additional stops for single packages, UPS and other carriers are testing out programs to improve sustainability. UPS’ programs focus on alternative fuels and driving algorithms, as well as piloting alternative ways to make fewer stops, especially in congested urban areas. In addition to these goals, UPS’ ORION program (On-Road Integrated Optimization and Navigation) uses technology to find the most optimized route. The algorithm includes the commitment time for package deliveries and customer pick-up times. The routing is created as the packages load. "We’re saving on average six to eight miles per driver per day," Browne said. That eliminates 100 million miles driven each year in the U.S., saving 10 million gallons of fuel. ORION was fully deployed by fall 2016, and saves $400 million per year in gas and labor. They’re using technology for "how not to drive a mile," said Browne. UPS will begin testing the next generation of ORION this year. The current version is static, setting a route before the driver begins delivery, whereas the updated program will change the route navigation, optimizing it throughout the day based on real-time information about traffic congestion, road conditions and requests for new package pick-ups. "Every mile matters. Every second matters to the carriers." E-commerce has forced UPS to reconsider how it delivers packages, especially to residences. Creating density, a way to deliver multiple packages to one stop, is a concept still in refinement. When delivering one package per stop, there’s no density and the cost to deliver increases. One program they introduced is UPS My Choice, which gives customers a choice of a convenient time and place for delivery. They’ve created a network of access points, like gas stations, dry cleaners and lockers for delivery. Amazon and FedEx are also experimenting with lockers or centralized pick-up locations partly to cut down on last mile issues. Making these kinds of investments in innovation has a direct impact on the bottom line for a company like UPS. "It’s good business. It increases productivity," said Beth Davis-Sramek, professor in supply chain management at Auburn University’s Harbert College of Business. "Every mile matters. Every second matters to the carriers," she told Supply Chain Dive. Amazon runs many sustainability programs, including wind farms, decreasing packaging materials and heating some corporate buildings with recycled energy, but its efforts to increase sustainability in last-mile delivery are not seemingly on the radar. Amazon entered the delivery market, albeit through outsourcing, using regional logistics providers. It’s now directly recruiting and helping small delivery companies supplement its package flow. Amazon ordered 20,000 diesel Mercedes vans for its Amazon delivery service partners program created last year. The company received flack for not having at least a portion of them using alternative fuel. Amazon did not respond to Supply Chain Dive’s request for comment on this issue. UPS is trying to minimize its environmental impact as a service provider, while Amazon’s role in the supply chain is different, and its delivery involvement is nowhere close to the same scale as UPS, Davis-Sramek said. "I don’t think Amazon will ever completely become its own transportation provider," said Davis-Sramek. 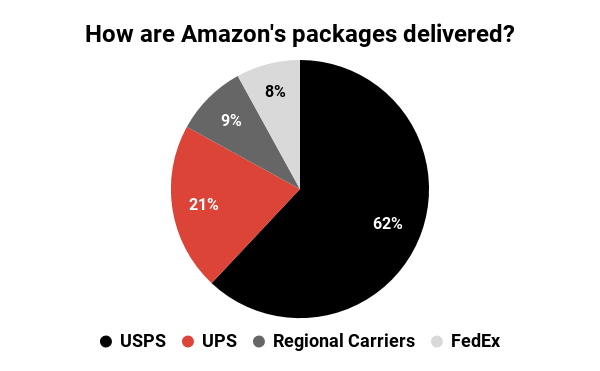 About 62% of Amazon’s packages are delivered by USPS, with another 21% by UPS and 8% via FedEx. USPS follows its government-mandated sustainability program, and FedEx has initiatives as well. While Amazon uses many carriers for its deliveries, there’s no been no public push from stakeholders or analysts to encourage or force vendors use green technology, especially in the U.S.
"Our European delivery fleet is comprised of a growing number of low-pollution electric and natural gas vans and cars, and we are using e-cargo bikes for deliveries in some urban centers," an Amazon spokesperson told Supply Chain Dive in an email. UPS and FedEx also are testing similar programs in Europe. According to Davis-Sramek, the act of reporting sustainable measures can improve tracking, methodology and process. It can challenge the people inside a company to do better, making sustainability wins happen. UPS makes its stated sustainability goals, initiatives and progress publicly available on its website. While Davis-Sramek lauds Amazon’s stated goals of powering its global infrastructure with 100% renewable energy and powering Amazon Web Services (AWS) the same way, "what they’re disclosing is so shallow that it’s window dressing compared to other companies." She noted that retail behemoth Walmart’s disclosure is far ahead of Amazon’s. "There’s so much transparency about their footprint," she said, with stated goals, dates and current status. "Every year they give you progress on what they’ve done to meet those goals" in the retailer’s annual sustainability report. Walmart’s 2017 report is almost 200 pages, with granular details. "Companies like Amazon don’t want consumers to make that connection – it messes up their business model." Amazon publishes no sustainability report and is the largest publicly traded U.S. company not to participate in the Carbon Disclosure Project, a nonprofit that surveys companies annually about carbon emissions data. Eighty-five percent of Fortune 500 companies produced a corporate sustainability report in 2017, according to the Governance and Accountability Institute. At the 2017 BSR conference, which focused on redefining sustainable business, Amazon's director of worldwide sustainability and social responsibility told the audience she rejected others telling them what reporting formats to use, and that they’re not credible if they don’t report a certain way. "If they’re not adding a huge amount of value to whoever you’re focused on — and for us that’s our customers — then don’t do it. 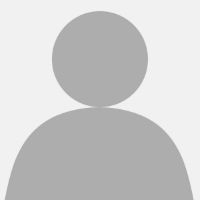 Don’t engage," said Kara Hurst. Most consumers don’t make the connection between their own buying habits, expecting fast and convenient service, and ignoring the resulting environmental issues. "Companies are not explaining it to them either," Davis-Sramek said. Amazon’s Prime model with fast and free shipping doesn’t encourage customers to bulk up orders so they’re delivered in one package. Even if consumers order numerous items at the same time, hoping to lower that delivery carbon footprint, the items may still come from different warehouses, potentially requiring additional trips. If consumers really care about the environment and want companies to minimize their environmental impact, they need to understand how their buying behaviors make it difficult for companies to comply. "Companies like Amazon don’t want consumers to make that connection — it messes up their business model," she said. "You can run more fuel-efficient modes of transportation, create more efficiency and reroute schedules to minimize the number of miles. That doesn’t mitigate the total footprint of everything involved with making that delivery happen."